"Starry Night interactive animation" aims to provide an immersive interpretation of Van Gogh's original masterpiece; the iconic flows of original painting come to life, in a hypnotic animation. The viewer is further engaged by interacting with the painting; almost infinite variations can occur, as the flows are driven by his hand. The background ambient music is also responsive, making the experience even more intense. 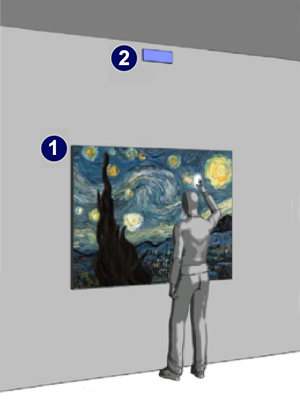 Lot of effort was put on creating an interactive piece that respects the original masterpiece; "Starry Night" had to be completely deconstructed and then accurately reconstructed. In other words, the "machine" is actually drawing the painting from scratch. The animation was designed to be as simple and elegant as possible. The installation can be used for "re-discovering" classical art and serve educational purposes. The installation components are shown in the image on the right: a computer (not shown) renders the animation in real time and presents it in a large monitor (1). The visitor's touches are tracked by a kinect sensor (2). A demonstration video was uploaded to vimeo and youtube in February, 2012. In less than three months it reached over 1.5 million views and received many positive comments from important internet sites and thousands of posts in the social media (facebook, twitter, blogs etc). Also, it was broadcasted in global TV networks as "France24" and "Canada Discovery Channel". "Van Gogh's Starry Night modded into beautiful interactive light and sound show. ... This is one of those little projects you wish you could just play with the second you've seen it." "The effect is so beautiful and mesmerizing." "Vrellis took a piece with a seemingly unsurpassable amount of artistic merit, and breathed new life into it." "Bring a Van Gogh painting to life... This astonishing video will draw you in to an enchanting and psychedelic world." "A very fascinating version of ‘Starry Night’." "Designer Petros Vrellis adds a whole new dimension with his animated and interactive version of the painting"
"The results, which also have a musical soundtrack, are quite stunning"
"Some artists, for example Petros Vrellis, are using technology to unlock new dimensions in existing artworks. Petros hypnotised the world with his animated version of Starry Night by Van Gogh, capturing the imagination of a new generation of art lovers that seem more curious than ever, constantly asking 'what happens if we do this?' "